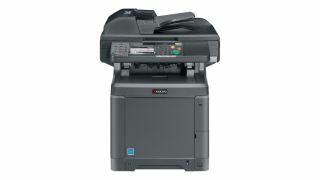 Kyocera is launching a multi-function printer for A4 sized paper that it says has the attributes of an A3 model and is right for small to midsized workgroups to handle high volumes. Named the TASKalfa265ci, it has a 200,000 page drum and is capable of printing at 26 pages per minute and scanning at 35 images per minute. Some manufacturers claim the latter is more important as it is based on an ISO standard and there is no uniform standard to determine a page, taking in factors such as the volume of text and images. Features of the TASKalfa265ci include Kyocera's HyPAS software platform, a 4.3 inch colour touchscreen display, two paper trays, two further optional media sources and Blue Angel environmental certification. When printing sensitive data a secure printing function restricts access so that users authenticate themselves on the touchscreen. Jonathan Robbins, Product Marketing Manager at Kyocera, said the TASKalfa265ci was developed from listening to the company's dealers.